The Town of Rosemère has distinguished itself yet again at the 2017 National and International Edition of Communities in Bloom. 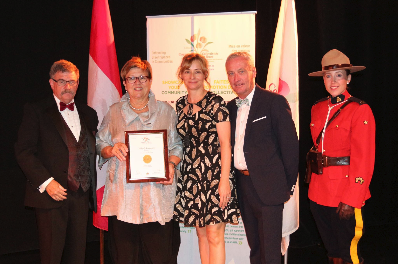 Rosemère received a “5 Blooms – Gold” rating as well as a special mention for Country Character at the awards ceremony held in Ottawa on September 16. The Town of Rosemère participated in the International Challenge (medium) category along with the towns of Beaumont (Alberta, Canada), Brooks (Alberta, Canada) Dauphin (Manitoba, Canada), Grado (Italy), Niagara-on-the-Lake (Ontario, Canada) and Opatija (Croatia). For Madeleine Leduc, mayor of Rosemère, these new distinctions reflect the tremendous environmental awareness of the Town and its citizens. “Every year, this competition helps to further foster a strong sense of belonging in the Rosemère community. We are so very proud of this prestigious award, which attests to the beauty of Rosemère and its notable concern for the environment,” stated Madeleine Leduc.